Presidency University PG Admission Test PUMDET 2019 - Presidency University, Kolkata has released notification from eligible candidates for admission to various Post-Graduate Program through an Entrance Exam, which will be conducted by West Bengal Joint Entrance Examination Board (WBJEEB) for the academic year 2019 -20. For 2019-20 academic sessions, the Board will conduct common entrance examinations titled PUMDET-2019 for admission to two year M.A. /M.Sc. Course. For 2019-20 academic sessions, the Board will conduct Common Entrance Examinations titled PUMDET-2019 for admission to three year M.A. /M.Sc. Course in the Presidency University. 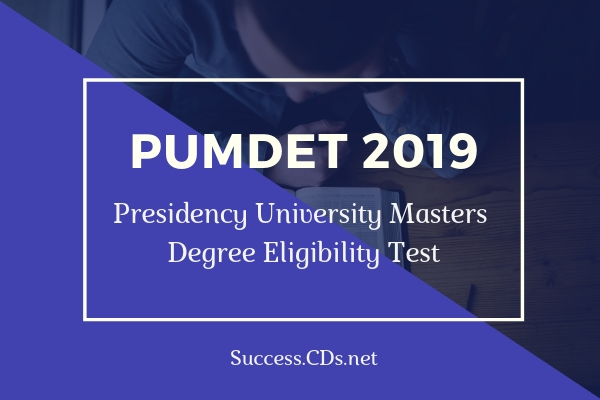 Exam Name: PUMDET 2019 is for admission to Post Graduate Courses. For the academic session of 2019-20 the Board is going to conduct the Common Entrance Exam) PUMDET-2019) for admission into two-year M.A. /M.Sc. Courses in the Presidency University in Open quota (Non-PU quota) seats. Bengali (16 Seats); English (16 Seats); Hindi (13 Seats); History (19 Seats); Philosophy (10 Seats); Political Sci. (16 Seats); Sociology (13 Seats); Life Sciences (26 Seats), Chemistry (16 Seats), Applied Economics (13 Seats); Geography (13 Seats); Applied Geology (10 Seats); Mathematics (11 Seats); Physics (16 Seats), Statistics (11 Seats). Candidates who have passed (not before 2018) or appearing B.A. (Hons) / B.Sc. (Hons) final examination in 2019 from any recognized University, are eligible to apply for and appear in PUMDET-2019. The candidate must have passed (not before 2018) or appeared in B.A. (Hons)/B.Sc. (Hons) examination in 2019 from any recognized University. Candidates, who have appeared for their B.A. (Hons)/B.Sc. (Hons) examination and have their final results at the time of counselling will have to mandatorily produce all original mark sheets/grade cards of all semester/annual examinations passed at the Bachelor’s level. Such candidates must fulfill the academic eligibility norms for their applied courses tabled below for admission. Candidates, who have appeared for their final B.A. (Hons)/B.Sc. (Hons) examination, but do not have their final results at the time of counselling, will be given provisional admission, on the basis of production of their previous mark sheets/grade cards of all previous semester/annual examinations at their Bachelor’s level. However they must submit their final mark sheet by 31st August 2019, demonstrating that they fulfil the minimum conditions of eligibility tabled below, failing which their admission will stands cancelled. Therefore the candidate must secure the minimum required percentage of marks/CGPA in Hons./major subject as per the following table in his/her B.A. (Hons) / B.Sc. (Hons) exam for final and confirmed admission. Besides the minimum aggregate as shown above, the candidate must also fulfil following special academic criteria for admission in respective courses. The reservation policies of West Bengal State Higher Education Institutions (Reservation in Admission) Act, 2013 and West Bengal State Higher Education Institutions (Reservation in Admission) Rules, 2014 will be followed for admission in reserved seats for SC/ST/OBCA/B. Requirements in terms of Residential/Domicile Criteria: (a) There is no particular Residential/Domicile requirement to appear in the PUMDET-2019. However, the State (West Bengal) Residential/Domicile requirement is applicable for admission in any reserved category of seats). Under-Graduate (Major/Honours Subjects) syllabus of Presidency University or its equivalent of any recognized Indian University. The medium of tests will be English except for vernacular subjects like Hindi and Bengali. In every subject, all questions will be of Multiple Choice Questions (MCQ) type, with four options against each of the questions. There will 50 (fifty) questions in each paper, full marks 100 and time 90 minutes. Questions are to be answered on specially designed optical machine-readable response (OMR) sheet, which will be evaluated by the method of Optical Mark Recognition by specially designed machines and therefore it is very important to follow the correct method of marking. There will be 4 (four) alternative answers for each question. Candidate will indicate response to the questions by darkening the appropriate circle completely with blue/black ball point pen. Any other kind of marking e.g. filling the bubble incompletely, filling with pencil, cross mark, tick mark, dot mark, circular mark, over writing, scratching, erasing, white ink, marking outside the bubble etc. may lead to wrong/partial/ambiguous reading of the response. WBJEEB will be, in no way, responsible for such eventuality. The examination will be conducted in various zones e.g. Kolkata Central, Kolkata - North, Kolkata – South Howrah, Kharagpur, Berhampur, Malda, Kalyani, Bankura, Haldia, Asansol, Burdwan, Durgapur, Siliguri, Coochbehar, Srirampur. Any of the exam centres may be dropped if adequate number of candidates is not available. Application has to be filled up online at the Portal www.wbjeeb.in. Candidate needs to visit the portal and follow the links <Examinations> - <PUMDET > - <ONLINE APPLICATION>. Candidate has to input name, date of birth, gender, mobile number and email id. Candidate must take utmost care to give these inputs. If mistakes are committed, there is no chance of correction. The mobile number and e-mail id entered will be used for all subsequent communication. Candidates also have to choose a login ID and password and remember them, which he/she will use for future log-in. PUMDET candidates have to first choose group-A or group-B of subjects and then choose maximum two subjects from his/her choice of group. The Amount of Application Fees to be paid for appearing in the PUMDET-2019 is Rs.500/- (Rupees four hundred only) plus the Bank’s Service Charges as applicable. The Exam Fees can be paid in cashless mode by ‘Net Banking’/‘Debit Card’/‘Credit Card’ or in cash using Allahabad Bank e-challan. If offline mode is chosen, an e-challan will be generated automatically. Candidate need to take a print of the challan and pay the fee in any branch of Allahabad Bank.